Our part in this story began two days ago. 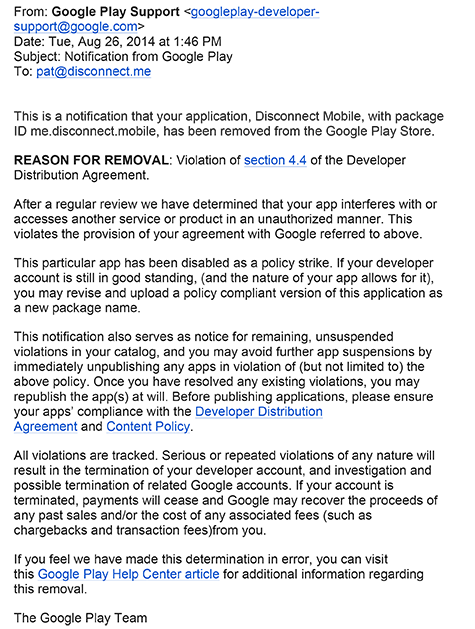 As our small team excitedly prepared for the imminent PR launch of our mobile privacy apps for iOS and Android, our CTO Patrick Jackson received this email from Google, notifying us that they’d removed the application from the Play Store after only five days. Rather than block all advertisements, we only block the privacy-invasive ads that invisibly track you and may be responsible for distributing malware (malvertising) and other security threats. We also generally unblock ad tracking websites that commit to respect users’ Do Not Track (DNT) preferences and agree to comply with DNT as defined by the Electronic Frontier Foundation: https://www.eff.org/dnt-policy. We’re not alone in wanting privacy and security protections from online advertising, and we have every reason to believe that there is huge pent-up demand for the banned product. Over 2 million people actively use our desktop products and the most common customer request - by far - is to bring similar products to mobile. 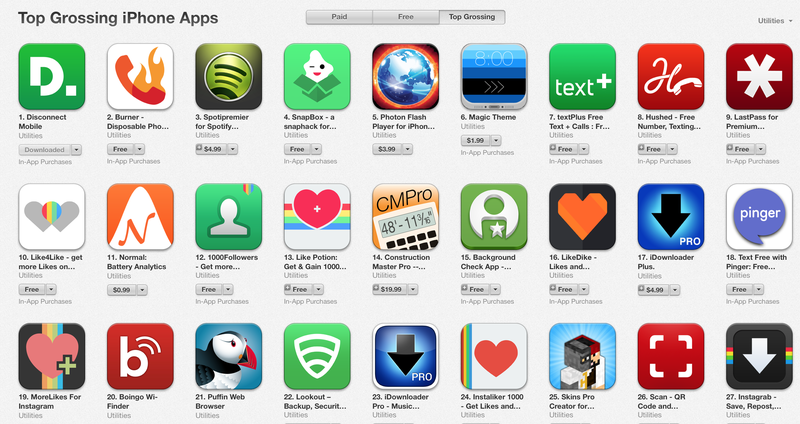 Indeed, we had quietly launched the identical iOS version of the banned Android app a few weeks back and this past weekend it became the #1 grossing Utility app on iTunes! Even more indicative of market demand is the fact that we have lined up several distribution partnerships that could have reached over 100 million people over the next few months. We are determined to oppose Google’s decision and hope our app will be available in the Play Store again soon. But at the same time, this experience has effectively wiped out months of hard work and has highlighted a serious and increasingly dangerous problem: Google has way too much power over distribution of applications on Android and can kill applications at will without justification. This is why efforts to create alternative Android based platforms that respect user privacy - like Blackphone’s PrivatOS (on which Disconnect is the default search provider and a pre-installed application) and CyanogenMod (a more open aftermarket firmware distribution for Android devices) - are so important for the future of the increasingly Android-based Internet. In addition to promoting alternatives, we will be challenging Google to reinstate our app in the Play Store, and to update its policies to respect developer rights and an individual’s right to protect their privacy and security. Further, we will continue to work with and support the efforts of pro-privacy groups like the Electronic Frontier Foundation, Center for Democracy and Technology and Fight for the Future.